Most of us know that GM and Toyota battle it out each year for global auto sales leadership, but how many of you know who is the No. 3 automaker in the world? If you said (guessed) Volkswagen, you are correct, and thanks to ‘people’s cars’ such as the 2014 Passat, VW will not be relinquishing that position anytime soon. Yes, the company that brought us ‘Fahrvergnügen’ sells more cars around the world than Ford with quite a bit of product produced right here in North America, Passat included. Chattanooga, Tennessee is where the German automaker builds its midsize sedan. Volkswagen is also part of a global family that includes Audi, Bentley, Bugatti and Lamborghini. 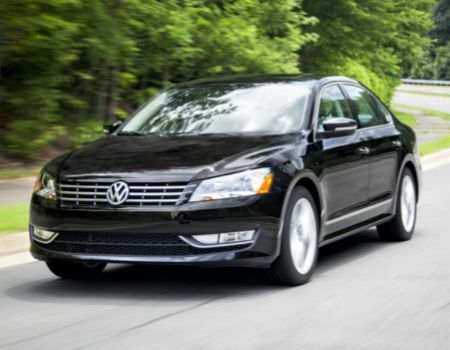 The 2014 Passat SEL Premium recently stopped by for review amidst what has seemed like an endless barrage of midsize sedans from the competition. 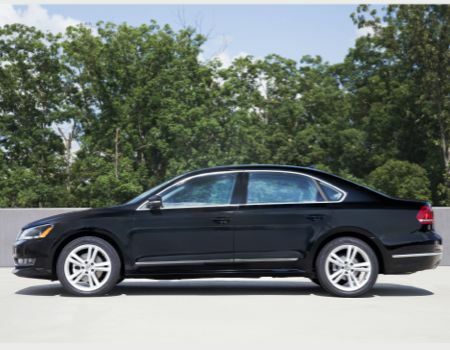 The Passat was a pleasant surprise beginning right from the window sticker with pricing starting at 21 grand and this nicely appointed model arriving at under $32,000, about six grand lower than most of the vehicles we have seen lately. One might think there would be a huge offset in amenities with this disparity in pricing but not so with the Volkswagen. I was pleasantly surprised to see how well equipped it was along with the fact that it boasted some of the best interior room and comfort in the class. A significant change for model year 2014 is VW dropping the base 2.5-liter gas inline four and replacing it with a peppy new 1.8-liter turbocharged direct-injected engine cranking out 170hp and 184 lb. ft. torque. This engine is backed by choice of five-speed manual or six-speed automatic gearbox with our tester arriving with the latter. Fuel economy ran in the 24 mpg city and 34 mpg highway range. On the outside, Passat’s styling would not be described as dynamic, more like straightforward and no-nonsense. Body lines are very clean and from some angles mirrors designs utilized by competitive models in years past but I don’t feel that is a key detractor. The driving experience is also not very dynamic but the turbo motor does provide some excitement when pressed into action. 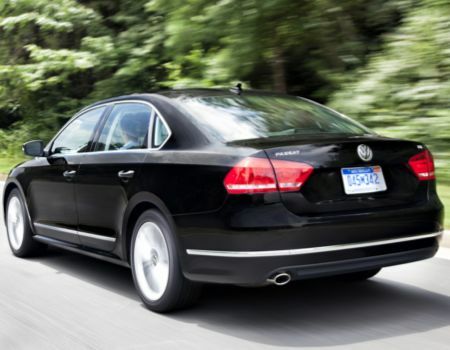 Passat does a good job at providing a very comfortable and stable ride. There were no options on the Passat as it arrived in the test driveway as nearly every comfort and convenience item was included from the nice Fender audio system to rearview camera and navigation. The sedan also featured nearly every safety and driving technology available as well. ‘Fahrvergnugen’ may have given way to ‘the power of German engineering’ these days but given the current state of driving in North America I will take the latter every time and twice on Sunday.